Ever since Apple bought the Finnish sleep tracking company Beddit in 2017, there's been no end of speculation regarding Cupertino's plans to track our sleep. The company has made its first move since the acquisition, launching the new Beddit 3.5 Sleep Monitor. Like the previous Beddit sleep trackers, this one is also a thin sensor strip that you place under the bedsheet to track your sleep behavior. It can measure length of sleep, heart rate, snoring, breathing and even bedroom temperature and humidity. All of which will, of course, be synced with Apple Health as well as the Beddit app. Oh, and it still syncs with the Apple Watch too. In our experience with previous Beddits, the sleep tracking has been impressively accurate, with the added appeal of not requiring you to wear anything on your body. However previous devices were also a little flimsy, and we weren't the only ones who found their Beddit eventually packed it in. Hopefully this is something Apple has fixed with the new model, which replaces the 3.0 version and is available to buy now on its website. It's a big month for Apple in the health space, which just rolled out its ECG feature for the Apple Watch Series 4. It's given much less fanfare around the new Beddit, but this shows the company is getting more serious about sleep. 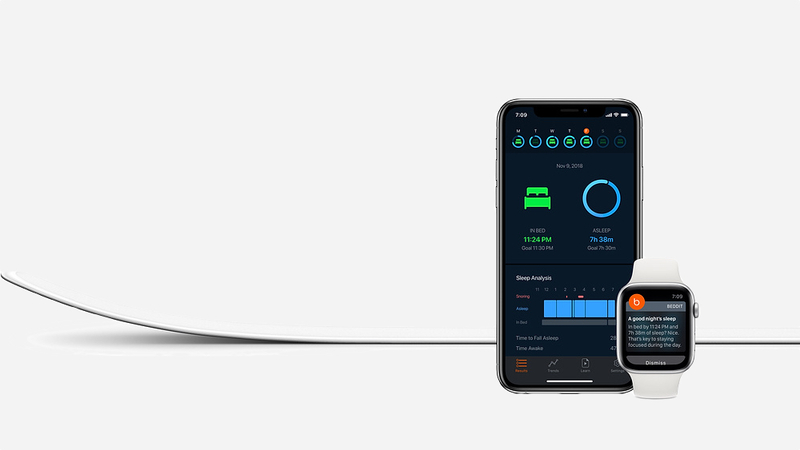 Right now the Apple Watch's short battery life is a problem for sleep tracking, but no doubt Apple envisions a day in the future where Beddit's sleep tech will live on your wrist.